– Wake up, put a spoonful of coconut oil in my mouth to begin oil pulling. – Go to my favorite big comfy chair in the office to pray and read my Bible. I’m currently studying Job and also using this Bible commentary. – Spit out oil and rinse mouth, make a mug of warm lemon water and prepare herbal tinctures. – Go back to Bible study while drinking lemon water. – Rinse out mouth from lemon water, take herbal tinctures and other supplements. – Do a few tasks around the kitchen. – Make a breakfast protein shake. This time it was Chocolate Vegan Shakeology, but other times I use this kind of chocolate bone broth protein along with almond milk, spinach, moringa, frozen blueberries, and ice. – Sit down on the couch to drink the protein shake and work on the computer. 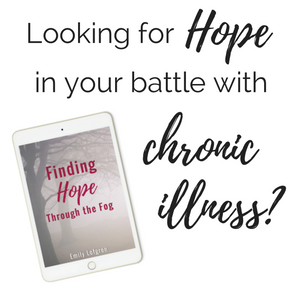 Do various blog tasks and connect with my friends from Hope*Writers. – Get up to take more supplements, put Ylang Ylang essential oil in the diffuser, and grab the heating pad. – Back to the couch to spend more time online replying to emails, checking social media, and creating a few images for Pinterest. – It’s time for a coffee enema! Eek. For some, the idea of coffee enemas is completely overwhelming, but I have found them to be really helpful for my healing journey. I use this enema kit and this kind of special enema coffee. – After getting everything ready for and performing the enema, showering, getting ready for the day, and cleaning up enema supplies, I’m exhausted! So I make more warm lemon water and this time add a little sea salt to it. Then I drink bone broth while I rest on the couch. – My fiancé, Jonathan, comes over and we review Ephesians 4 and 5 before we drive a few blocks to church for a premarital counseling session with our pastor. – Drive back to my house where we eat leftover lentil potato soup that I cooked the other night. Take supplements with dinner. – When we’re done eating, we talk about life, our relationship, and some misunderstandings we had previously been working through. Life with the anxiety of Lyme Disease can put a strain on relationships, so we are constantly learning how to cope, go to the Lord about our struggles, and genuinely trust each other. Tears are shed on my end, but we end the conversation feeling happy and content! – Jonathan and I play Dominion – our favorite game! – Jonathan leaves and I catch up on Voxer messages from Hope*Writers and then check social media while using the heating pad. – Eat a snack/meal and begin to draft a blog post. – Just sit and rest for a while. – Do a couple rounds of DNRS to retrain my brain. – Take bedtime supplements and go to bed. This made me feel better. I should write my own post about a day in the life of a chronic illness special needs mom blogger with two crazy dogs! I made myself tired just writing that. You should definitely write a post!! Haha… yes! It’s a lot.